Your landscaping goes a long way toward making your Chesapeake home look great — while even increasing its resale value! To get the most out of these qualities, you need to get the most out of your landscaping in any way you can. A great way to complement your Chesapeake landscaping is by adding a few great features to it. These features — including hardscaping and electrical installations — will help to add beauty and functionality to your landscaping, helping you to fully enjoy the aesthetic and financial benefits it can provide! If your yard includes only grass, trees, shrubs, and other natural components, the entire effect may become somewhat muddied. After all, your beautiful greenery looks its best when contrasted against man-made structures — such as hardscaping! From walkways to retaining walls to firepits, hardscaping can do a lot to add extra man-made beauty to your yard. Even better is the fact that these installations offer practical usability, so while enhancing the natural beauty of your landscaping, they will also help to make your life that much easier. When you finally achieve the perfect look for your yard, you might find yourself hard-pressed to spend much time away from it. Unfortunately, you won’t be able to sit back admiring its beauty when the sun goes down every night — unless you opt to get landscape lighting, that is! Landscape lighting will allow you to continue enjoying your backyard and even entertaining in it well after the sun has gone down. On top of that, landscape lighting will provide extra security for your home since it will help to deter potential prowlers. At the end of the day, though, your landscaping needs to look beautiful for anything else to help bring out its beauty. If you want your landscaping to look its best, you need to have it installed and maintained by an experienced landscaping company. 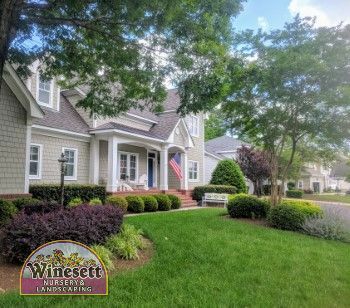 In the Chesapeake area, that company should be none other than Winesett Nursery and Landscaping. We offer a variety of quality landscaping services that will get your yard looking great. We even offer hardscaping and outdoor lighting services to make your yard look even better than great!